On September 21, 2016 we attended the 6th Annual Community Information & Resource Fair. The purpose of this fair is to offer a networking forum for community organizations to promote and learn about transition, re-entry, and support services for offenders returning to the community. It also helps provide case managers, returning citizens, families, parole/probation officers, volunteers, mentors, and workforce and employment consultants an opportunity to identify and understand available community resources. Each year we set up a table with pictures displaying the homes we offer and men who have successfully come through our doors. Many of these men have completed college, regained custody of their children, and have become positive mentors to new men returning to society. We always enjoy seeing the community of people whose desire it is to help and love on people who come out and experience barriers that the rest of society don’t have. We so enjoyed this particular fair for more than one reason. First, Pastor Joseph was excited to be asked to be one of the guest speakers during the opening ceremonies. He was honored to find himself seated with key IDOC staff, Department of Labor, and Channel 7 News, as well as a wonderful young woman whose story of her past, her incarceration and her recovery brought tears to everyone’s eyes and reminded us all why we do this. Pastor Joseph spoke from the heart when it was his turn. His desire was to glorify God and express his appreciation for the IDOC staff who have always had a heart to help inmates and returning citizens. His story and thoughts were well received and also brought tears to the crowd. Jeff Kirkman was the Master of Ceremonies and did a wonderful job introducing each speaker and keeping the event fun and interesting. 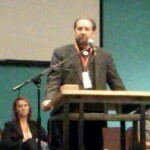 Many awards were given out to organizations and people who make it their goal to continue to bless and help the least, the lost and the forgotten. 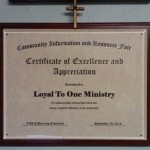 Pastor Joseph was very surprised when Jeff announced Loyal To One Ministry had received one of these special awards for its part in lovingly mentoring and housing men returning to society, while maintaining a 3% recidivism rate. 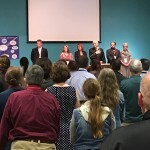 Jeff called Desiree up to the stage and she and Pastor Joseph were honored to receive it together. 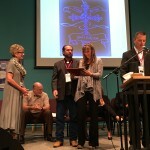 This award is for all of us who touch all the different parts of this ministry. Every moment, every dollar, every prayer, every kind word has made this ministry of love and dedication to the least, the lost and the forgotten. Thank you for recognizing us and thank you for your support.